If you're staying up to see in the new year, here's a game you might want to try to while away the hours until midnight. I was introduced to this game on Exercise Tenderfoot, the first week-long exercise in my training in the Royal Marines. One afternoon we were waiting for an instructor to arrive and one of our section leaders introduced us to this game to while away the time. If you've spent the last few days sharpening your reflexes on a Nintendo Wii, PlayStation PS3 or Microsoft Xbox, you are probably honed and ready for this - it's a real-world recreation of a classic computer game - Space Invaders. Next ask your invaders to line up in 7 rows (with 4 in each row) with an arm's length between each row, along one wall of the room and facing the opposite wall. The defender waits against the opposite wall with the supply of projectiles. As the drill instructor, you need to manage the invaders. Take command! When you shout "One", they must snap to attention, with their feet together and their arms by their sides. When you shout "Two" they should step their left foot to their left, squatting down and raising their arms to the "I surrender" position. When you shout "One" again, they return to the attention position by brining their right foot up to their left. 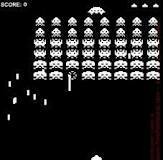 As you command "One, Two, One, Two, One, Two..." the invaders will move to their left (and the defender's right) until they reach the wall. At this point you give the command "Three" at which point they all take one pace forwards. Now they start each "Two" move with their right foot, moving to their right. While your invaders begin their advance towards the defender, he or she attempts to stop them with the projectiles. Each invader hit by a projectile is knocked out of the game and moves off the playing area. The invaders win if any of them reach the defender's wall before being hit by projectiles. The "special" runs along the wall behind the invaders wailing "Woowoowoowoowoo..." and waving their arms above their heads. If the defender is able to hit them they win the game outright.